Two men from the Liverpool area have appeared in court charged with firing a distress flare onto the pitch during a football match in Aberdeen. The pair made no plea and were released on bail. Tristan Berry, 18, from Birkenhead and Ian Lewis, 21, from Liverpool appeared from custody at Aberdeen Sheriff Court. They were arrested outside Pittodrie on Tuesday night after the flare was alledgedly fired from a cemetry behind the south stand. It bounced off the pitch during the Aberdeen Liverpool friendly narrowly missing some players, and eventually landed in the opposite stand. The match was stopped temporarily after the incident, which happened a few minutes from full-time. Liverpool won the game 5-1. 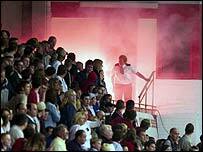 "The flare narrowly missed the main stand"